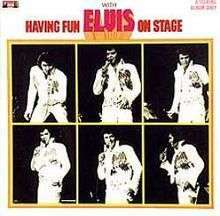 Having Fun with Elvis on Stage is a 1974 spoken word concert album by Elvis Presley. The album consists entirely of byplay and banter by Presley from between songs during a live concert—primarily jokes, with the songs themselves removed from the recording. The album was created as a ploy by Presley's manager, Colonel Tom Parker, to self-release an Elvis Presley album through his own label, Boxcar Records, that would not consist of content that contractually belonged to RCA Records. Having Fun with Elvis on Stage was first distributed at Elvis Presley concerts, but RCA would later package and distribute it. Having Fun with Elvis on Stage has been considered to be Presley's worst album; critics felt that the compilation of banter was incoherent, and lacked context due to the removal of the songs that his remarks related to. In their 1991 book, Jimmy Guterman and Owen O'Donnell named Having Fun with Elvis on Stage the worst rock and roll album of all time, duly noting its lack of actual "rock and roll". Presley himself disapproved of the album, and it was withdrawn at his request. Despite this, Having Fun with Elvis on Stage reached number 130 on the Billboard 200, peaked at number 9 on the Billboard Hot Country LPs, and spawned bootleg copies along with a fan-made sequel. The album is unique among Elvis Presley's recordings as it does not contain any actual songs; it consists entirely of byplay recorded between numbers. Presley is frequently heard humming or singing "Well ...", which during the actual performances led into songs that have been edited out of the recording. Much of the album consists of him making jokes, although the recording is devoid of any context. Despite the randomness of the audio, from 8:01–11:55 on side A, Presley is captured speaking autobiographically about his early life and his career aspirations before becoming a singer, and his early appearance on The Steve Allen Show. The album was the idea of Colonel Tom Parker, Presley's manager. Parker wished to release an Elvis Presley album through Boxcar Records—a company that he formed to manage Presley's commercial rights, so that he could profit directly from it. However, since Presley was signed to RCA Records, any recordings made would legally belong to RCA. To circumvent this restriction, Parker compiled audio of Presley talking—material over which RCA could not claim rights. Initially, the record was only sold at Presley's concerts. However, the album was later packaged and marketed by RCA as a legitimate concert album, with the only warning for the buyer being the subtitle "A Talking Album Only" on the back cover. Presley is credited on the back sleeve as the album's executive producer. Having Fun with Elvis on Stage has been described as the worst album of Elvis Presley's career. Critics felt that the album's material was spliced in a manner lacking any continuity and nearly devoid of comprehensibility, let alone humor. Mark Deming of AllMusic states that "some have called Having Fun with Elvis on Stage thoroughly unlistenable, but actually it's worse than that; hearing it is like witnessing an auto wreck that somehow plowed into a carnival freak show, leaving onlookers at once too horrified and too baffled to turn away." Nick Greene, a writer for Mental Floss, felt that the material presented on the record is "so incoherent, you don't really get an idea of his stage presence, despite the fact that all the audio comes from his shows." Rock critics Jimmy Guterman and Owen O'Donnell, writing in their 1991 book The Worst Rock and Roll Records of All Time, named it the worst rock album ever, although one could easily note the lack of "rock and roll" in the record. The album peaked at number 130 on the main Billboard album chart, and peaked at number 9 on the Billboard Hot Country LPs chart. At the request of Presley, the album was eventually discontinued. However, bootlegs of the album are popular, and an anonymous person created a Having Fun With Elvis on Stage, Part Two record that has been circulated. The original album remains unavailable on CD, but it has been reissued as a series of three 10" records in the United Kingdom. 1 2 3 4 5 6 7 8 Greene, Nick (October 7, 2014). "Listening to Elvis Presley's Bizarre Album of Stage Banter". Mental Floss. Retrieved January 10, 2015. ↑ Nash, Alanna (2002). The Colonel: The Extraordinary Story of Colonel Tom Parker and Elvis Presley. Aurum Press Ltd. p. 285. ISBN 978-1-85410-948-4. 1 2 3 4 5 Deming, Mark. "Elvis Presley Having Fun with Elvis on Stage". AllMusic. Retrieved June 20, 2015. ↑ Roy Carr and Mick Farren, Elvis: The Illustrated Record (Harmony Books, 1982), p. 156. 1 2 3 4 5 Guterman, Jimmy and O'Donnell, Owen. The Worst Rock n' Roll Records Of All Time (Citadel Press, 1991). 1 2 3 4 "Having Fun with Elvis". Hymies Vintage Records. October 29, 2012. Retrieved January 10, 2015. 1 2 "Hot Country LPs". Billboard. 86 (52): 36. December 26, 1974. Retrieved January 10, 2015.